"Will we hear a new marketing program from FTDNA?" This was a query that crossed my mind as I considered the impact of Ancestry.com entering the autosomal DNA testing market. We have you to thank for the tremendous success of the Family Finder product that launched in early 2010. Since that day some 10's of thousands of individuals have tested seeking answers to their genealogical questions. Children have found parents and half-siblings have randomly ‘found’ each other within the database. Family Tree DNA is proud to have played a part in those wonderful reunions. In an effort to thank each of you for your participation (which makes these matches possible), we are offering a one-time use coupon for you to share with any individual that you believe would like to order the Family Finder at $179. Simply copy and share the coupon code below. We appreciate your past participation and invite you to share it with a friend or family member. Special Note: Coupon code has a firm expiration date of June 10th 2012 and is good for one use only. Offer only valid for credit card payments. Enter the coupon code during the checkout process to purchase at the promotional price. If you are thinking of trying the Family Finder test, the price is now attractive. The normal price has been $289. If you have already taken this test, you may want to use your coupon code [deleted from my post] to another family member to help triangulate your results and narrow down what part of your family tree your matches are coming from. If you are unsure about the usefulness of autosomal testing for your research, type "autosomal" in the search box in the upper left part of this blog page to be referred back to earlier posts on the subject. I have just made contact with a group of descendants of a line of CLEM/KLEMM and ancestors who share other various spellings of this surname. It appears that we all descend from Johann Davidt KLEMM (b. 1717) & Ann Maria (GOMAR). These are my 6th great-grandparents. This cluster of descendants is being reassembled through autosomal DNA matching. Autosomal DNA matching is a very fickle process for cousins this far in the past. I only have a significant match with one of them. However, others show matches with each other and with my match. Autosomal DNA is almost an exact science back to second cousins. Only 90% of third cousins who are actually related will show up as matches. That number falls to about 50% for fourth cousins and about 10% of fifth cousins. Sixth and more distant cousins (the range of the KLEMM cluster) only show up as matches less than five percent of the time. This is because autosomal DNA is remixed with each inter-generational transfer. As this happens some of the adjacent portions of DNA are broken into smaller and smaller segments. After a few generations it is difficult to associate a particular segment of DNA with another descendant of that particular ancestor. Johann Davidt KLEMM was born in Ittlingen and Anna Maria GOMAR was born in nearby Adelshofen. Both of these villages are in the Baden-Württemberg area of southern Germany. They appear to have been married there in 1741 before they migrated to North America. Their last child to be born in Ittlingen was born on March 21, 1746/7. One of their children was born in Pennsylvania on September 4, 1748. Their last child was born in Frederick County, VA in 1757. Johann Davidt died on March 10, 1787 at Powell's Fort Valley -- part of the Shenandoah Valley of Virginia. It was in this area that Samuel GROVE, Sr. was born in 1785 and where he married Mary MOYER in 1807 before they moved on to Licking County, OH between the birth of their first child John in 1810 and the birth of their second, Anna, in 1812. They are my third great-grandparents. I can trace my GROVE/GROFF line back to Switzerland just before 1600. Our GROFF/GROVE ancestors were in Switzerland at the beginning of the 17th century and probably moved to Steinsfurt, Baden about 1675. My KLEMM ancestors lived in Ittlingen and my 7th great grandmother Anna Maria GOMER was born in nearby Adelshofen--about an hours walk to the southwest. My GROVE/GROFF ancestors lived about an hour and twenty minute walk to the north in Steinsfurt around 1700. Ittlingen was along a typical migration path for Mennonite/Ana-Baptist dissidents. By 1655 the first Swiss refugees settled in Ittlingen. We have yet to trace the KLEMM line back to Switzerland but it is certainly possible that was their location around 1600. The Ana-Baptist/Mennonite dissident community was very tight knit community. I have discussed a more exact mitochondrial DNA match within this sect in a blog post a couple of months ago. I just got an email notice that AncestryDNA has launched. If you read the document linked in the previous sentence, you will note that as of now it is only being offered to current Ancestry.com subscribers. Even for the million or so of us, the offer is being phased to spread out the anticipated demand. Apparently the offer is going to be made to those of us who signed up in advance to be notified. For those that did make that request, we must wait for a specific invitation to order. Is there really going to be that much initial demand or is this just hype to get us to rush to order? Only time will tell. What appears to be offered is an autosomal test. This means that it is a test that both women and men can take on a level playing field. At least initially, the price seems right. It appears that $99 will be the initial price. That's about one third what similar tests from FTDNA (FamilyFinder) or 23andMe (RelativeFinder) have been charging. Of course 23andMe has offered that as an entry price if an monthly subscription fee is agreed to. As with most things, the devil is in the details. Will Ancestry get DNA testing right this time? Their track record with Y-chromosome DNA testing was less than outstanding. Although the launch of this new autosomal test has been clouded in secrecy, Ancestry has certainly made a big investment in this product launch. Only time will tell if the company understands that when it comes to applying genetics to family history research, customer service and helping customers match with others is more important than the science of DNA. If this new service gets any traction in the marketplace, expect FTDNA and 23andMe to respond in some way--possibly in the form of a price war. Both of them have offered autosomal testing for two years. 23andMe also offered testing for health issues including drug reactions. 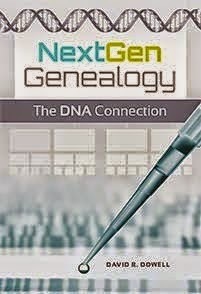 FTDNA also offers Y-chromosome (male on the paternal/surname line) and mitochondrial (both genders up the maternal line) testing that are more specific than autosomal testing bur only offer information on two of your ancestral lines. If you are unclear about how autosomal DNA testing may be able to help you in your research and/or what its limits are, you should have time to educate yourself before you will have the opportunity to order a kit. I have several earlier posts on autosomal DNA. The most recent of them is linked here and you can follow the thread back in time. Also check out CeCe Moore's excellent blog, YourGeneticGenealogist which focuses on autosomal DNA research and interpretation. There is also a 23andMe Newbies discussion group on Facebook. Have you DNA tested yet? If not, why not? If you have tested, what have you learned?